awaken by a well known domestic migraine, I had plenty of time to think about who I could pay an homage to. 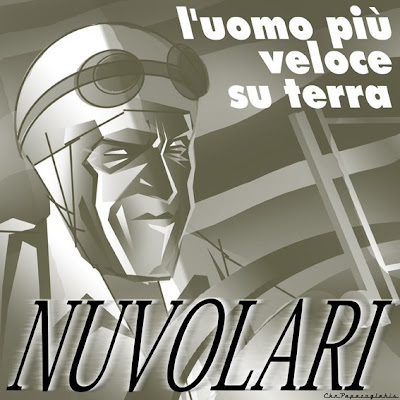 TAZIO NUVOLARI, the fastest man on earth. you google and learn something by yourself, but nuvolari began his racing career on a motorbike, his only reason to live was racing and winning. He drove his car around a track with the steering wheel off, drove throught the night of the mille miglia at 100mph (average, on moutain dirt roads) without his headlights on to surprise his competitors, another year his ferrari fell bit by bit but he kept flooring it until he had to sit on a bag of oranges after his seat broke down, he drove grand prix with fractured vertebreas, beat the german war machines on their race track with an older slower alfa romeo, although known to spend more time in the hospital than in his car, he just never gave up. Mr. nine digited yankee, here's your first french lesson. Alain Bashung has been around since 1979. He's one of the first singer that made french songs evolve from traditionnal to a more anglo-american flavored music. I do not have any other records than his very first 45, but I just like his latest song, and it's a special private joke to someone I love whom I sent the first song last night, quote "you shouldn't leave me alone at night". jusqu'au jour où je ne t'aimerai plus..
Hier on se regardait à peine, c'est à peine si l'on se penchait. Aujourd'hui nos regards sont suspendus, résidents, résidents de la république. où le rose à des reflets de bleu. Ok, fucker -- so who's that and why should I care? :) Sorry, don't speak a word of French (Spanish, German, or Japanese I can fake)... but I like the tunes and presentation, so enlighten the Yankee!